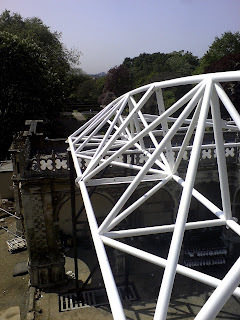 The photo at the head of this entry shows the over stage truss and gives something of a clue as to the scale of this new canopy (thanks to Brendan for going up in the cherry picker and taking the shot). Over this will be spread the stage tensile fabric and the large main canopy will be attached at the front. On the ground, at the base of the upright leg, you can see the elaborate steel contraption that creates a firm foundation without the need for huge concrete blocks on such a delicate site. Great care has been taken with this aspect of the canopy design and installation. Where concrete is inappropriate, special steel has been designed or, in some cases, thin 'helical' screws have been inserted into the ground so as not to have concrete disturbing tree roots, foundations etc. In some cases, such are the enormous forces of the canopy, these screws extend 15 metres into the ground. One of the engineers explained how this device creates a sort of funnel shaped plug ahead of it etc etc. He lost me halfway through the explanation. "Will it hold the bloody thing in?" I asked. "Yes", came the reply - the only explanation I was after really. The first reaction of anybody seeing the over-stage truss tends to be "Bloody hell". Considering the canopy itself will extend higher still, it does suggest the scale of the new structure. It really will be a magnificent space. James's weekends are now filled with trepidation - unexpected phone calls and emails are never far away and rarely bring good news. He had one such on Saturday bringing unfortunate tidings about one particular singer. Not insurmountable but a brisk reminder of what the next few months may have in store for him. Frankly, he can deal with anything (very little will ever compare to the abyss into which he stared after the first night of Queen of Spades last year) but I suspect he could do without the grief. Clarinda continues to breeze her way through mounting challenges. In fact, I hesitate to call them challenges for fear I might insult her. She has assembled a small army of interns, the combined musical and academic qualifications of which would mount a serious challenge to any educational institution in the land. If they all brought in their instruments we could start an orchestra. We had something of a customer relations nightmare when we invited Friends to attend the free test night on 30th May. The tickets had gone within about an hour of being made available and those with a less efficient postal service we left out in the cold. We somewhat misjudged the desire of Friends to be there on what we THOUGHT we had made clear would be at best a rough rehearsal and at worst, intentional chaos. We did not think any would be that keen to attend! A lesson learned and lots of apologies to disappointed Friends. You live and learn. One rather irate Friend called me directly to complain. I muttered something about being surprised by the demand and that really, she wouldn't be missing much. "You are just saying that to make me feel better", she said. "No, I'm not, really" I stuttered. "Why not?" came the probably apposite response. You live and learn indeed.